THURSDAY NIGHT’S PBS-fest wasn’t a night of political pyrotechnics, but a good solid exchange that showed the strengths and weaknesses of both candidates. I scored it a win for Hillary Clinton. 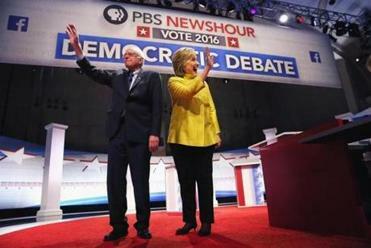 One of the most dramatic moments came in the last few minutes of the debate, when Clinton, who had wrapped herself in President Obama’s legacy, offered up several critical comments that Sanders had made of the Democratic incumbent. She expected that kind of thing of Republicans, but not of Democrats, Clinton said. “Madame Secretary, that is a low blow,” Sanders rejoined. Um, Bernie, this ain’t beanbag. President Obama’s name was mentioned 33 times during the debate, the first since Sanders trounced Clinton in the New Hampshire primary. Hyperbolic, perhaps, but hardly below the belt. And with the campaign heading toward South Carolina, where African-American voters will be pivotal, it was politically shrewd. It also underscored what is destined to become one of the central questions of the Democratic campaign: What, exactly, is realistic for progressives to expect to accomplish in a deeply divided nation? Sweeping systemic leaps, Sanders insists, if only voters rise up and demand it. Smaller steps that consolidate and build upon the victories of the Obama administration, Clinton asserted. To buttress that point and defend herself against Sanders’ criticism, Clinton repeatedly highlighted Obama’s example or positions. Sanders thinks a candidate who takes money from Wall Street can’t crack down on them? Well, Obama did. With Clinton fatigue besetting Democrats, her challenge was to explain the logic of Hillary in 2016, a task made more urgent by Sanders’ strong win in New Hampshire. He, by contrast, needed to present himself as a plausible president to a newly interested national audience. She did a more nimble and supple job meeting her challenge than he did his, presenting herself as a deeply knowledgeable candidate whose progressive stands are tempered by real-world practicality. When Sanders called again for a single-payer health care system, Clinton stressed that the focus should be on expanding coverage and care to those who still lack it, rather than starting from scratch and overhauling the entirety of the system. That won’t satisfy single-payer devotees, but it is far and away the more politically realistic idea. Sanders, by contrast, seemed something of a one-note Bernie, focusing as much as he did on Wall Street and returning again and again (and again) to that theme. On manner, Clinton also carried the day. She was conversational and pleasant, even when going after him. Sanders, by contrast, occasionally seemed something of a sour pickle. It’s not easy to argue realism versus idealism, smaller steps versus larger strides, political evolution versus political revolution. Yet on Thursday, Clinton did it deftly.